I have hopefully just bought a smelly plant for spring flowering in my rockery. Phlox divaricata ‘Clouds of Perfume’ is a woodland plant that also thrives in walls, borders or on banking. Versatile of what? It will grow 12″ tall and spread as a cushion 24″ wide. This Phlox is semi evergreen and likes well drained soil. It is also called wild phlox and grows as a weed in North America. Other common names include Wild Sweet William, Louisiana Phlox, and Blue Phlox. The flowers are powder blue, a cool shade I long to grow in my garden. The bonus of a mass of flowers giving out a good scent was a second incentive. Regular readers will know I am mean (I prefer to say thrifty) and I paid £1.50 for a large pot that was in an end of season sale. I have taken 6 rooted cuttings or divisions from the one plant and so I think I got a bargain. Phlox divaricata’Blue Moon’, Phlox divaricata’Chattahoochee’is lavender coloured, and white varieties of Phlox divaricata include ‘Fuller’s White’ and ‘White Perfume’. 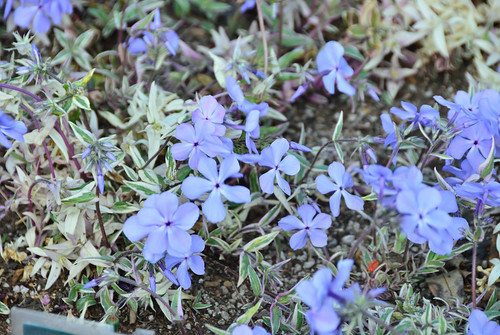 Phlox Divaricata “Montrose Tricolor” above has variegated leaves and lilac-lavender coloured flowers. Pot grown plants should be watered well before planting. Carefully remove from the pot and place in a prepared hole and firm the soil around the roots. If the plant is pot bound tease out the roots or separate off some cuttings. 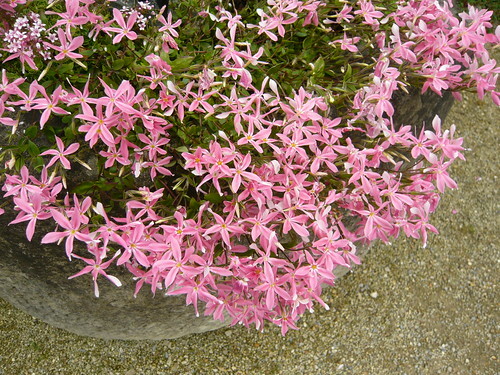 Water until the Phlox is established. Phlox adsurgens ‘Wagon Wheels’ is another low growing perennial favourite of mine in the Polemoniaceae family.